Remove contaminated clothing; Rinse the effected area with water for 15 minutes. Rinse the effected area with water for 15 minutes, to remove heat and hydrate a heat burn. Remember that even minor safety incidents need to be reported to the appropriate faculty or staff within 24 hours of their occurrence, preferably as soon as they have been resolved. 1. Immediately call the University’s TPA, UPMC Work Partners, at 1-800-633-1197 (24 hours/day, 7 days/week) to report the work-related injury or illness. 3. Emergency assistance may be obtained from campus Security or Public Safety Departments. 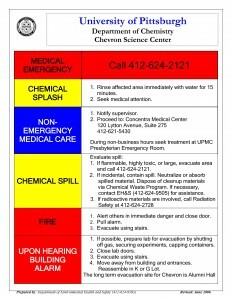 In case of a flood, fire or other emergency that has any potential to affect equipment, personnel, chemicals or paper records, the Department of Chemistry Emergency Protocol should be followed. 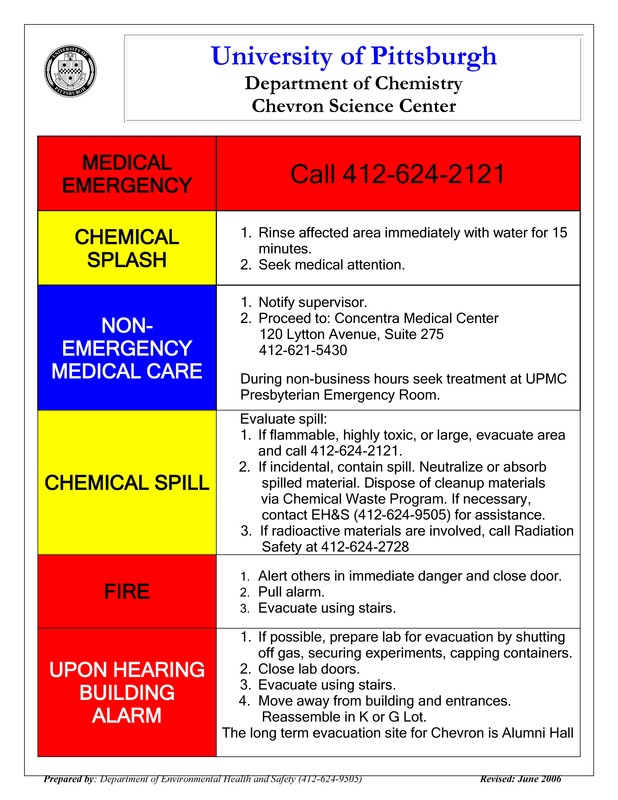 We have an Emergency Protocol that makes it a policy to report incidents to the Department of Chemistry after calling the Pitt Police (412) 624-2121 or EH&S (412) 624-9505 as necessary. 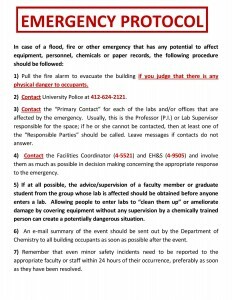 Please send suggestions for additions and corrections regarding the safety webpages via email to jcjst22@pitt.edu.